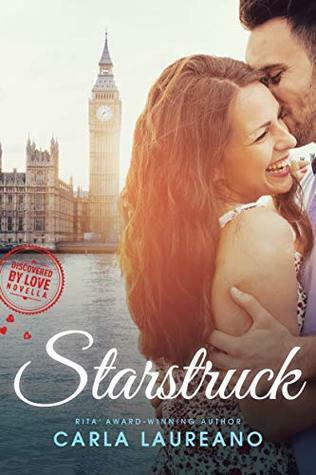 Starstruck (2018) by Carla Laureano is the second book in her Discovered by Love series. This book currently comes in eBook form, and is 92 pages in length. With a full-time job and a precocious six-year old at home, this book took me one sitting to read. I purchased a copy of this novel to review from Amazon on November 1, 2018. In no way has this influenced my opinion of the story. All opinions expressed in this review are my own. I give Starstruck 5 STARS. This book is a Clean Contemporary Romance. Oh my, did I LOVE Starstruck by Carla Laureano. This book is exactly the sort of thing a romance-loving girl wants to read on a lazy Saturday afternoon. This is the very first book by Laureano that I have read, but it most definitely will not be the last! I enjoyed everything about this book: the writing is superb and very well done, the story line is highly engaging, and the characters are drawn perfectly. Starstruck is an excellent example of a book that packs a lot into a small amount of pages. I definitely ended this story feeling satisfied! The heroine of this story, Christine, is a popular author. She is five books into a highly-acclaimed series, and is at FanFest in London to announce that her books are being turned into a TV show. What I love so much about Christine is getting an inside look into the mind of an author. I enjoyed Christine’s internal dialogue when a fan would ask for her autograph and picture. The fact that Christine is shocked by her fame is so real to life, at least based on all the authors I’ve ever met. They are truly some of the most humble people I’ve ever had the privilege to meet. In addition to this, I very much enjoyed watching Christine as she would go through her writing process. The way the characters would take over in her head, forcing her to write no matter what, seemed so true to real-life writers. All of this boils down to one very funny, highly engaging, and endearing heroine. I appreciate Laureano’s theme that failing does not make one a failure. I feel that somewhere along the way we’ve lost this important message. Today, it seems like people are so fearful of failure that many do nothing at all. But failing at something is NOT the same as failure. How can we learn if we don’t make a mistake or two every now and then? As Henry Ford once said, “Failure is simply the opportunity to begin again, this time more intelligently.” And, this is something that Christine really gets by the end of Starstruck. When we learn from our mistakes and failures we become the people God means for us to be! I cannot recommend Starstruck enough. This book definitely packs a punch, and will stick with me long after the final pages have turned. If you are looking for a highly engaging and well written Contemporary Romance to escape into on a lazy afternoon, Starstruck is most definitely the book for you! This sounds like a fun story and one that I should pick-up! Thank you for sharing your review!